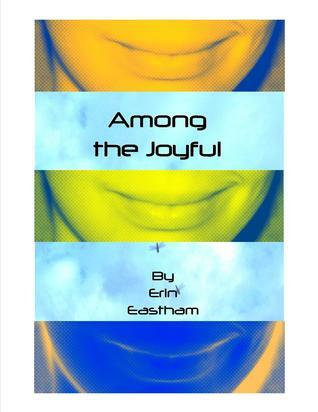 Erin Eastham’s recently released young adult novel, Among the Joyful, was a quick read. I was drawn into the narrative from the very first line and then stayed up way too late on a work night to get through the final line. Alaire, the main character, is a young lady who lacks the angst normal to the formative teen years, mostly because she doesn’t know what it is. She lives in Golden State, where happiness (or at least the appearance of it) is of foremost importance. In this “idyllic” planned society, it is each person’s responsibility to never infringe on the happiness of others, which not only means avoiding harsh or argumentative comments/conversations, but also never going out without a smile, as one person’s lack of smile could impact and ruin the day of another. Yes, everyone smiles, all of the time. (As I read, I actually tried to smile for an extended period of time. It is no easy task when it isn’t based on an actual emotion. It doesn’t take long for cheek muscles to tire and lips to dry out. No fun when it isn’t for real.) As a member of the coveted Joyful Court at her high school, Alaire is a role model to the other students. Until, her world comes crashing down and she discovers empathy- that the world is not all smiles and Joyful Court meetings- there is sadness, heartbreak, disappointment and a whole range of emotions that she has never been allowed to experience. There are many things to like about this novel, but probably my favorite is all of the references to other young adult books. I love that Alaire’s emotional awakening comes from within the pages of books. I always contend that reading fiction is a great way to walk a mile in someone else’s shoes and experience parts of the world that the reader has never encountered. It builds empathy and understanding. This is exactly where Alaire starts to fall apart- the empathy and understanding piece. Within the first few pages, I was thinking to myself how much this novel reminded me of Lois Lowry’s writing in The Giver, so I was thrilled when just a chapter or two later, Alaire stumbles upon this staple of young adult literature. It only gets better and she then comes across another classic, The Bridge to Terabithia and what is bound to be a new bedrock of the genre, The Fault in our Stars. And of course, the title of the novel, Among the Joyful, is a nod to Margaret Peterson-Haddix’s fantastic YA series, Among the Hidden. All of these references, both outright and subtle, made me love this book from the very beginning. My only confusion comes with the ending. As I read the book, I liked that it was a single, stand-alone novel. So many YA books these days are written as a part of a series (which are supremely beneficial for reluctant readers), but I do enjoy a good novel that can tell its story in a single sitting. I was very onboard with that idea throughout the book, but then when I hit the end, I wondered if it was meant to be a set-up for a sequel. Without providing any spoilers, but in all honestly, I liked the rather abrupt ending, as it left the reader to imagine where the tale’s characters would end up, but I worry that instead there will be a “book 2” and I am not sure the material is there to stretch for another couple hundred pages. This isn’t a criticism of the book, as I have no knowledge of an impending sequel, but I would like to imagine Eastham is done and will write another engaging novel with a different set of characters, so I can spend another sleepless night following their tales. I can see you sitting there, smile frozen on your face with a determined look to go with it. You almost convinced me I need to read this book, as I have read some of the others you mentioned. I am loaded down with my list, so not just yet. But good try. I don’t recall another five shell, but I may not have been paying enough attention. I don’t read covers on books either, I am afraid, as has happened, that they will give away plot lines the author has gone to great lengths to develop just so, ruined in an instant. So careful about book revues also. I also don’t usually read book covers because I hate the spoilers! It is something I aways struggle with in my reviews- how to be fair without really giving away the story.